, a very learned and eminent critic, was born, according to his son’s account, April 23, 1484, at Ripa, a castle in the territory of Verona, and was the son of Benedict Scaliger, who, for seventeen years, commanded the troops of Matthias, king of Hungary, to | whom he was related. His mother was Berenice Lodronia, daughter of count Paris. From the same authority we learn, that Scaliger was a descendant from the ancient princes of Verona; but while other particulars of the birth and family ol Scaliger are called in question, this seems to be refuted by the patent of naturalization which Francis I. granted him in 1528, in which such an honourable descent would unquestionably have been noticed, whereas in this instrument he is called only “Julius Caesar della Scala de Bordons, doctor of physic, a native of Verona.” When therefore, his critical asperities had raised him enemies, they did not fail to strip him of his royal origin, and instead of it, asserted that he was the son of a school-master (some say an illuminator) of Verona, one Benedict Borden, who, removing to Venice, took the name of Scaliger, either because he had a scale for his sign, or lived in a street called from that instrument; and although Thuanus seems inclined to consider this story as the fabrication of Augustine Niphus, out of pique to Scaliger, it is certain that the royal origin of the Scaligers has always appeared doubtful, and we have now no means to remove the uncertainty. He was taught Latin at home, and, according to his son, had for his preceptor John Jocundus of Verona, whom he himself in various parts of his works mentions as his master; but even this circumstance his opponents are not disposed to credit, and tell us, that as he was the descendant of princes, it was necessary to provide him with a preceptor like Jocundus, who was a man not only of high character, but a gentleman by birth. They also add some circumstances which certainly make it doubtful whether Scaliger really was taught by Jocundus, because it was neither by his knowledge of Latin, nor by philosophy or theology, that Jocundus acquired his reputation, but by his skill in the fine arts. 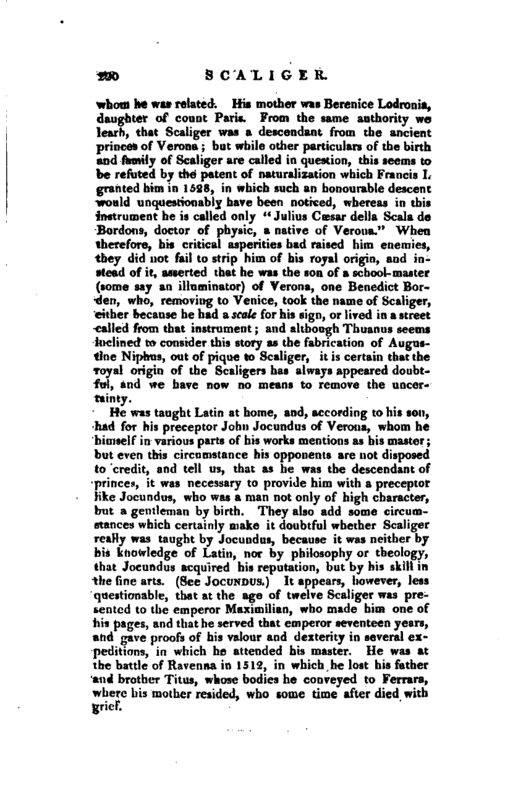 (See Jocundus,) It appears, however, less questionable, that at the age of twelve Scaliger was presented to the emperor Maximilian, who made him one of his pages, and that he served that emperor seventeen years, and gave proofs of his valour and dexterity in several expeditions, in which he attended his master. He was at the battle of Ravenna in 1512, in which he lost his father and brother Titus, whose bodies he conveyed to Ferrara, where his mother resided, who some time after died wkj> grief. | His father dying in narrow circumstances, Scaliger found himself almost without a maintenance, and therefore resolved to enter into the Franciscan order, for which purpose he went to Bologna, and applied himself vigorously to study, especially to logic and Scotus’s divinity; but changing his views of the ecclesiastical profession, he agaiiv entered into the army, and served some time in Piedmont. 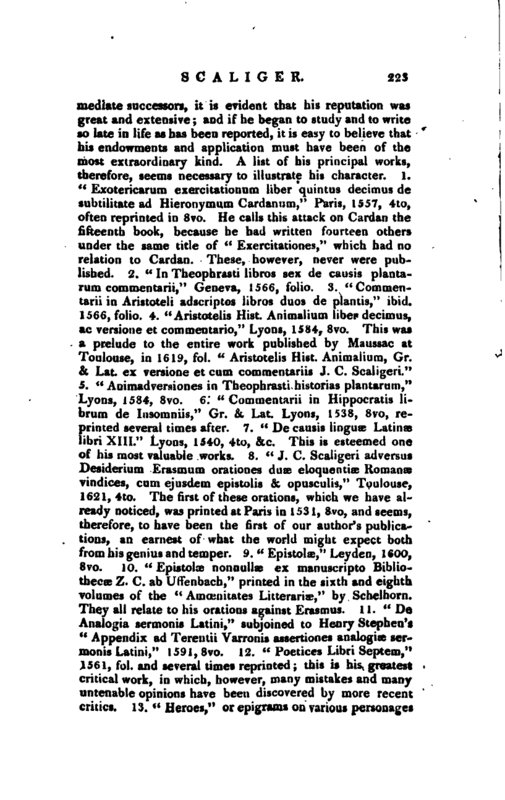 A physician, whom he knew at Turin, persuaded him to study physic and accordingly he prosecuted it at his leisure hours, while he was in the army he likewise learned the Greek language, of which he had been entirely ignorant till then. At length, frequent attacks of the gout determined him, at forty years of age, to abandon a military life, and devote himself entirely to the profession of physic. In this he had already acquired both skill and fame, and the bishop of Agen, being indisposed, and apprehending some need of a physician in his journey to his diocese, requested Scaliger to attend him. Scaliger consented upon condition that he should not stay at Ageu above eight days: there, however, he conceived an attachment for a young lady, said to be not more than thirteen years of age, and remained at Agen waiting for her parents’ consent. That obtained, he married her in 1529, lived with her twenty-nine years, and had fifteen children by her, seven of whom survived him. Whatever his origin, he must have been now a man of some consideration, for this lady was of a noble and opulent family. 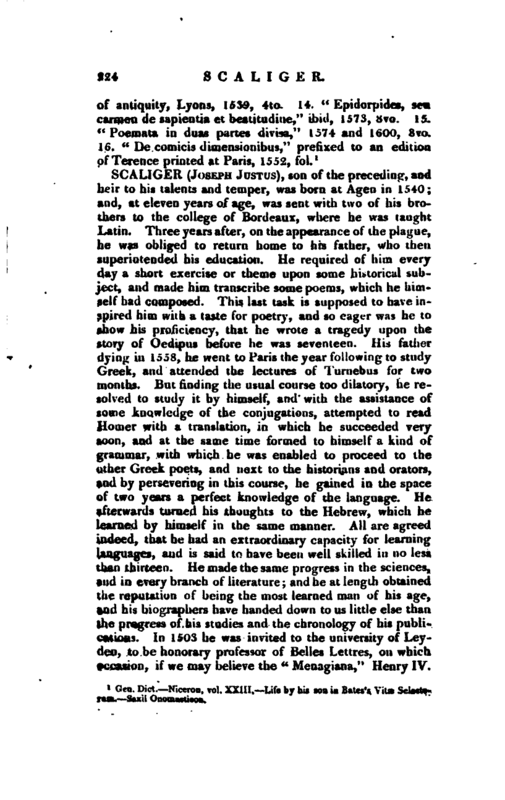 His son Joseph has described him as a man with many excellent qualities both of body and mind; tall, well-made, of a noble and venerable air, and very strong and active even to old age of such sagacity, that he could divine the characters of men from their looks of a prodigious memory; singularly averse to every departure from truth, and so charitable that his house was a kind of hospital to the indigent and distressed. With these good qualities, however, he had an insupportable pride and vanity, and a fastidious and petulant temper, which was excited to fury by every difference from his opinions, and every, the least contradiction, or fancied mark of disrespect. 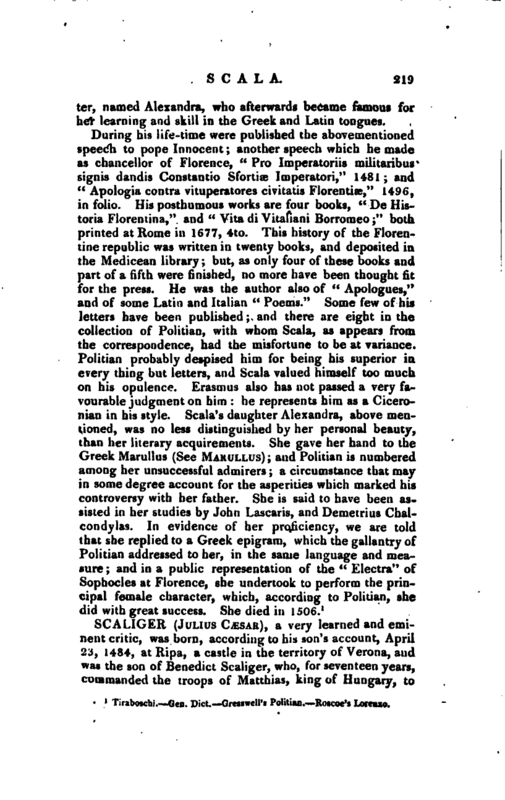 This appeared particularly in his treatment of Erasmus, who, in his “Ciceronianus, sive de optimo dicendi genere,” had ridiculed certain of the learned in Italy, who would allow no expressions to be pure latinity but what were to be found in Cicero; and had even criticised the style of Cicero himself, for whom, nevertheless, he had the profoundest veneration. This provoked Scaliger to publish two orations in his defence; in which he treated his antagonist with the utmost virulence of contempt. 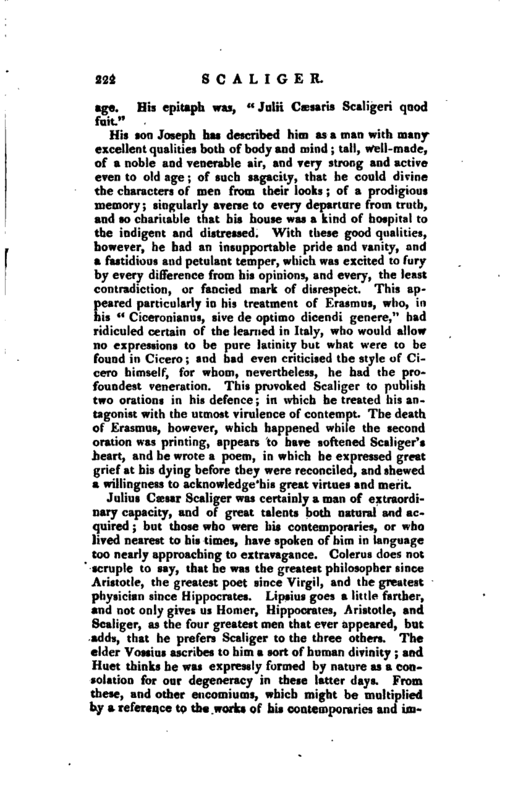 The death of Erasmus, however, which happened while the second oration was printing, appears to have softened Scaliger‘ s heart, and he wrote a poem, in which he expressed great grief at his dying before they were reconciled, and shewed a willingness to acknowledge his great virtues and merit. Gen. Dict. —Niceron, vol. XXIII. 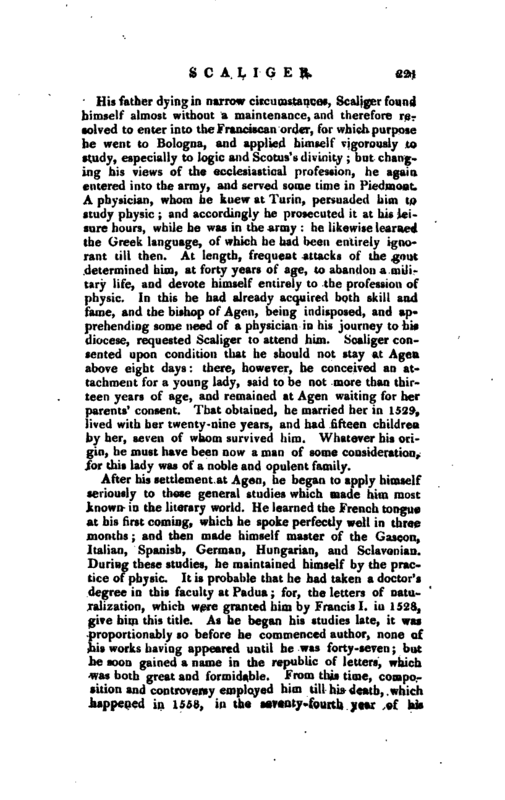 Life by his son in Bates’s Vitae Select*, turn. —Saxii Onomasticon.